A NIGHT IN NEON CITY! 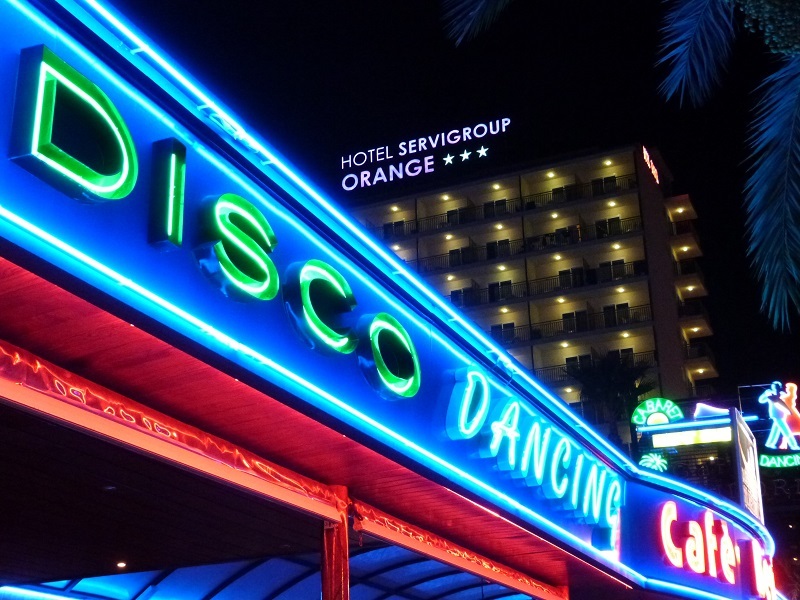 From dusk until dawn, Benidorm does it better and cheap than any other resort. Benidorm really does take on a totally different persona as the sun goes down beyond the Poniente. The zone everyone calls “The Square” in the Rincon de Loix slips up several gears as day turns to night and a thousand neon lights wink at you, tempting you into over 150 central pubs, clubs, and cabaret venues. The “Square” refers to the area where the infamous “Café Benidorm” is located and is the hub of the entertainment zone. In reality, it is actually a triangle from Morgan´s Tavern at one end to the Marina Hotel at the other. The triangle is crisscrossed with enough venues to keep even the most demanding punters happy. 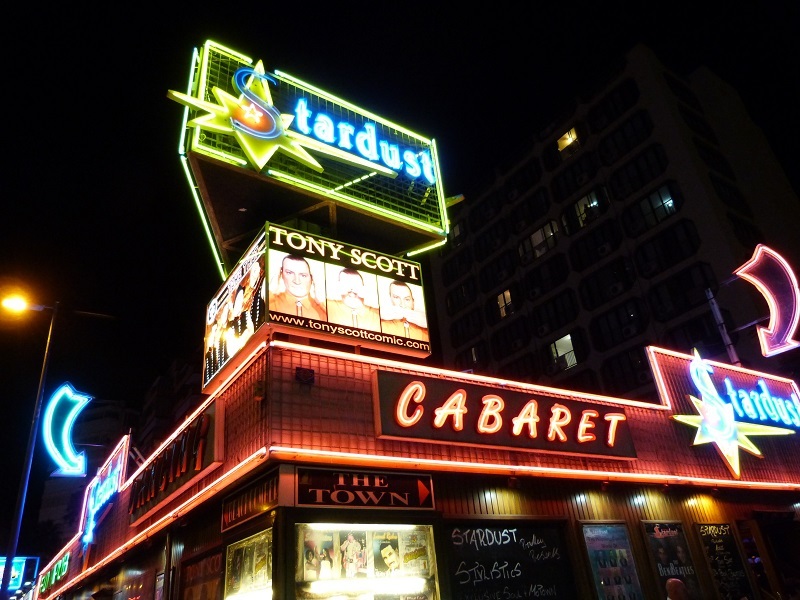 You will be kept howling with laughter, toe-tapping, line dancing or enjoying a tipple or three after a late night feast at the dozens of (many British) café bars squeezed tightly between the giant cabaret venues. Every night let the big names entertain you from some cracking tribute acts. 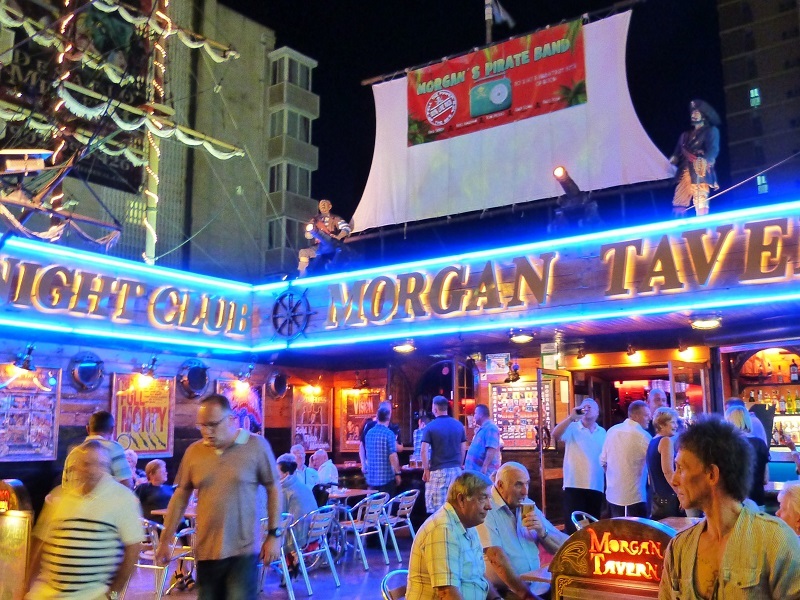 TAKE THAT will have you going wild in the wee small hours at Café Benidorm and Morgan´s Tavern. And up the road, WESTLIFE will be crooning at Valentine’s and Rockerfellars. For those who are getting on in their years and prefer the gentleman of rock go see MEATLOAF at Jokers and ROD STEWART seems to skip across town at various venues from early until late. These artists are great, like the perfume sold all over Benidorm you know they are not the genuine article, but you simply have to have some. And amazingly unlike the fake perfume they look and sound just like the real thing. Around town, you will also come across tribute acts like Celine Dion, Elvis, Adele, Michael Jackson, Boyzone, Bruno Mars, Pink, Il Divo, and even The Beatles and an ABBA or two. It is doubtful that you will find a more diverse bunch of hardworking and badly paid entertainers anywhere in the world and all this comes to you with no door charge, simply the price of a few drinks. If you miss an act early doors you will catch many of them late at another venue in town. Benidorm puts on a great show 365 days a year, it never stops. Yes, it is looking tired around the edges and some of Neon City lights are a tad faded, but it is all good, it is very friendly, very cheap and very British and it all starts again tomorrow night from dusk until dawn. 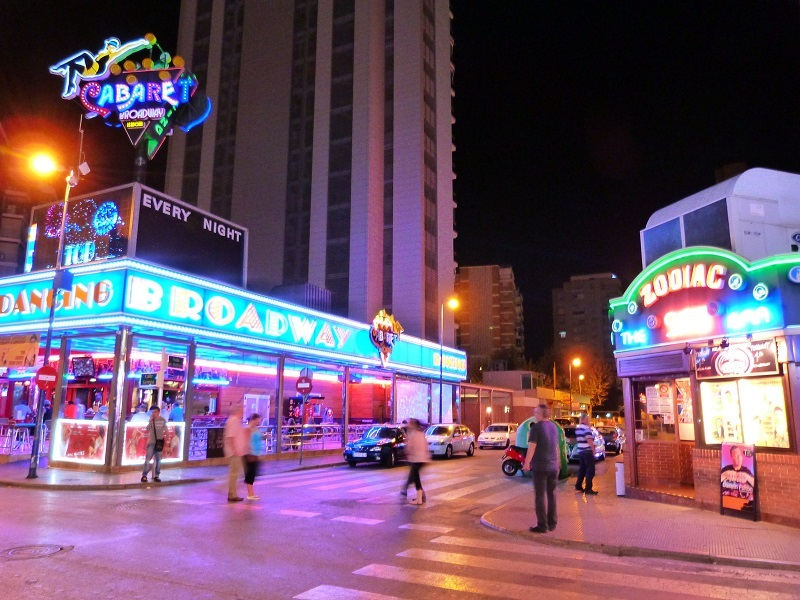 Come to see us soon and stay close to the big cabaret venues if you want to make the most of your time in Benidorm. We recommend either the brand new (opened summer 2018) superior 4-star HOTEL PRESIDENTE or always popular with British guest, the classic and rather lovely ServiGroup 3-star HOTEL ORANGE. Both just a stone’s throw from the “British Square” and Playa Levante.